Welcome to a rather full edition of the Queensland newsletter. Queensland had a very successful Oppy this year with all teams completing and with some outstanding record breaking to boot. More on that a little later. Here we are a few days out from the 2019 Fleche Opperman All Day Trial and I hope teams have completed their preparations for another awesome Oppy. I take my hat off to those riding the full distance – something I have yet to do but it is always in my plans. On a trip to the MCG I took time to read up on Sir Hubert Opperman in the Sporting Hall of Fame and took this photo of once of his steeds. Amazing what you find at teh MCG Sporting Hall of Fame. I wonder if bar mounted bidons will make a big return? Welcome to the March 9th edition of the Queensland Newsletter. This edition has some good reading for your rest day after a long ride. Remember to make sure all your Oppy preparations are in order – team and rider registration and course nomination because the Oppy is only two weeks away! Welcome to February 21st edition of the Queensland Region newsletter. This is a bit of a bumper edition due to the National and Regional AGMs being held in the last couple of weeks. We have a new club constitution and we saw some very good rides in the last fortnight. Jeff Franklin receiving the Martin Pearson Memorial Trophy for outstanding Audax riding. 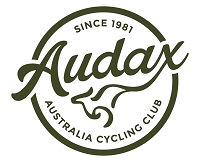 Audax is a sport that challenges us. I for one have challenged myself to ride longer but in recent times have struggled a bit mainly from lack of riding. What better way to challenge and nurse myself back to my better form than taking on the role of Newsletter Editor. Whilst many would think this particular edition is my handywork it is actually Keith’s final newsletter assembly as he gave me the run down on the process in a practical way – I merely penned the introduction . Thank you Keith for your dedication and by providing us with our newsletter in the recent past. Keith’s first newsletter showed a bike with training wheels which reflected his view at the time. I think my view is like a set of well crafted assembly instructions, not so much like a popular flat pack furniture brand, but more like the modern day interlocking brick or metallic bolt together toys that I spend time assembling with my Grandson. I look forward to the challenge, will put my particular feel to the newsletter and do ask that you continue to send ride reports and items of interest to AudaxQLD@gmail.com so I can include them. We have a few upcoming important events such as the National and Queensland AGMs plus preparations for this year’s Oppy so please read on. While there have been more excellent rides since the previous newsletter I’m a little short of first hand reports to share (hint, hint). What I do know is that its been hot and some of these rides were very long. Well done to those who prevailed. I’ve noted that we have two important meetings on the horizon, the AGM for the national and Queensland organisations. Many hands make light work and so if you wish to contribute to the Queensland committee in 2019, please get in touch. As usual there are plenty of great rides coming up. Finally, the Flèche Opperman. It’s now time to make ready your preparations for this iconic event. Happy 2019 to you all. The new year has started in fine fashion with a number of rides completed already. You can read about the 11 out of 11 below. I’m hoping those that did the 400 will recover sufficiently share their experiences also. Check out the upcoming rides, and with the national and regional AGM’s forthcoming, please consider contributing some time to the club committee.